During her lifetime, 1 in 8 women will be diagnosed with breast cancer, making it the number one killer of women aged between 40 and 55. Each year 2.5 million new cases of breast cancer are diagnosed worldwide and, depending on the country, more than 40% of these women will die from the disease. There is some hope, though: when diagnosed early enough, breast cancer can be treated successfully. 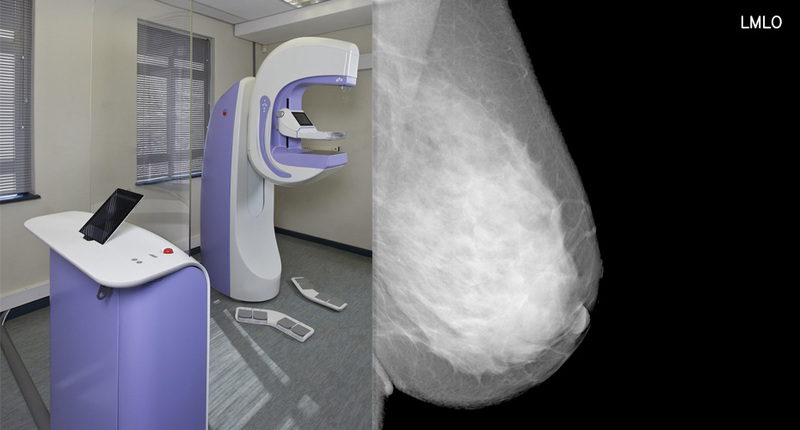 Mammography – an X-ray image of the breast – has been around since the 1960s and over the past thirty years screening mammography has saved many lives. 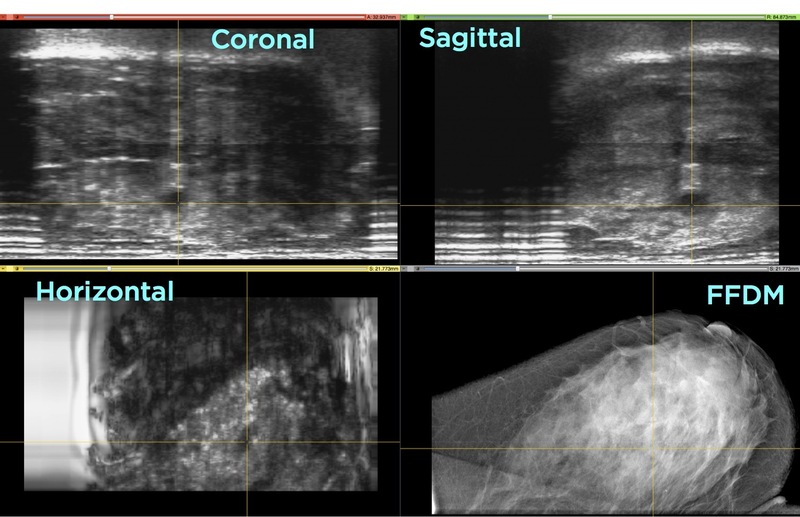 Although it is considered the gold standard for screening, the technique does have one major drawback: it fails to detect early stage cancers located in dense breast tissue (see images below). This is a major problem since 40% of women have dense breasts and a missed diagnosis, known as a false negative, can have devastating consequences for the women concerned. It can take a further year or two before the cancer is detected, during which period the tumour may have grown rapidly in size and perhaps metastasized to other regions of her body. Not only will the treatment costs have escalated steeply, the prognosis for a successful outcome will have diminished significantly. The key to success, therefore, is early detection. During the past decade, it has been shown by multiple authors that full-field digital mammography (FFDM) followed by ultrasound, particularly 3D automated breast ultrasound (ABUS), increases the diagnostic yield from 4.6 to 12.3 positive findings per 1,000 women [1, 2, 3, 4] This implies that the ideal screening strategy would be to employ FFDM followed immediately by ABUS. At CapeRay we have developed a novel engineering design that combines the best of low dose FFDM and 3D ABUS into a single device. This breakthrough technology thus co-registers the images from the two imaging modalities, significantly improving diagnostic accuracy in dense breasts. Our innovative solution has been built on a platform known as the PantoScanner where our first model is called Aceso, the Greek goddess of healing. The photograph below left shows our Aceso system as used in a clinical trial conducted at the University of Cape Town in April and May 2014. One of the healthy volunteers whom we studied during the clinical trial was 42 years old and had dense breast tissue. She had no prior history of breast disease and her FFDM image (seen below right) showed no evidence of a lesion. However, the ABUS images, when played back as a movie indicated unequivocal evidence of a fluid-filled cyst that was judged to be benign by the clinical specialists. The image below illustrates how ABUS can be co-registered with FFDM, and the lesion is clearly visible in the three ABUS images but not in the FFDM image. Reduced breast compression – less than 50 N is required (as confirmed in our recent clinical trial) since FFDM with slot-scanning does not require the breast to be compressed as much as a flat panel detector, and Aceso’s ABUS probe has a penetration depth of 90 mm. Berg WA, Blume JD, Cormack JB, Mendelson EB, Lehrer D, Böhm-Vélez M, Pisana ED, Jong RA, Evans WP, Morton MJ, Mahoney MC, Larsen LH, Barr RG, Farria DM, Marques HS, Boparai K for the ACRIN6666 Investigators, “Combined screening with ultrasound and mammography vs mammography alone in women at elevated risk of breast cancer”, Journal of the American Medical Association, 299(18): 2151-2163, 2008. Schaefer FKW, Waldmann A, Katalinic A, Wefelnberg C, Heller M, Jonat W, Schreer I, “Influence of additional breast ultrasound on cancer detection in a cohort study for quality assurance in breast diagnosis – analysis of 102,577 diagnostic procedures”, European Radiology, 20(5):1085-1092, 2010. Kelly KM, Dean J, Comulada WS, Lee SJ, “Breast cancer detection using automated whole breast ultrasound and mammography in radiographically dense breasts”, European Radiology, 20(3): 734-742, 2010. Giuliano V, Giuliano C, “Improved breast cancer detection in asymptomatic women using 3D-automated breast ultrasound in mammographically dense breasts”, Clinical Imaging, 37(3): 480-486, 2013.